Every so often, a song comes along that completely changes the face of popular music. This week in 1991, the ARIA chart welcomed a rock track that would usher a whole new genre into mainstream consciousness: grunge. Grunge would come to define the '90s - and for a number of years it put pure pop on the back-burner as record companies all clambered for their own angst-ridden, self-loathing, flannelette-wearing band. Needless to say, I wasn't thrilled. 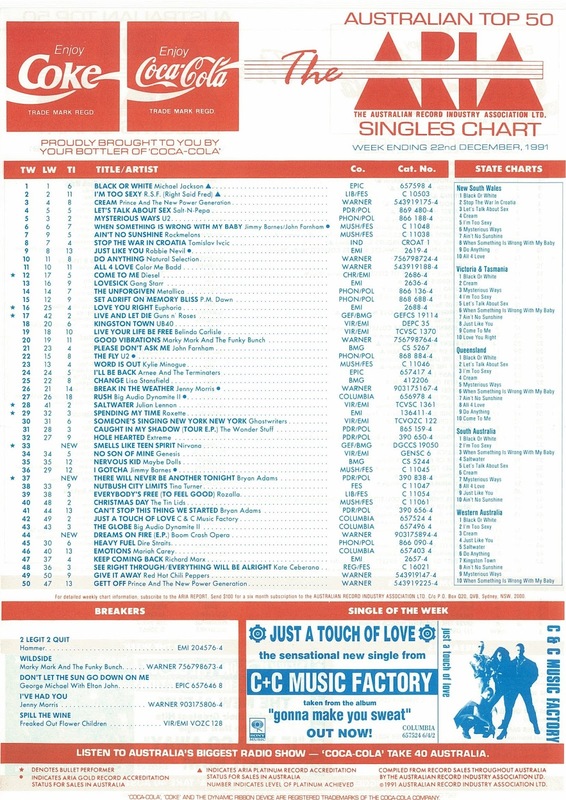 A song I was thrilled about was still number 1 this week in 1991. "Black Or White" by Michael Jackson spent a fourth week on top. 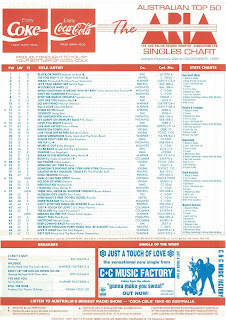 Actually, with this chart, it spent a fourth, fifth and sixth week at number 1, since this top 50 was actually for the three weeks ending January 5. But since it's not labelled as that, we're looking at it now. The 1985 power ballad from Theatre Of Pain was rejigged to promote the hard rock band's first compilation, Decade Of Decadence. At least this time it made the ARIA top 100. Following The Wonderstuff's recent tour souvenir EP, fellow British rockers The Godfathers released this collection comprising three singles and two album tracks. Made all the more poignant by the recent death of Queen vocalist Freddie Mercury, this Innuendo track served to promote the band's new Greatest Hits II album. 1991 was a bit of an odd year for Boom Crash Opera. Founding member Richard Pleasance, who was unable to perform with the band due to his tinnitus, put out his debut solo album, but returned to the studio to work on this stop-gap EP, which wasn't among BCO's best work. First track "Holy Water", which was used to promote the release, showcased a harder sound for the band. That wasn't a problem in itself - but the song just wasn't up to their normal standard, which may well explain why the EP progressed no further. Boom Crash Opera would be back on track in 1992, but would their third album be more successful? As you'll see below, he ended 1991 with the year's top-selling single (as if there was ever any doubt), but the chart-dominating days of "(Everything I Do) I Do It For You" were behind Bryan Adams by the time this third single from Waking Up The Neighbours was released. The fact the album hadn't left the top 10 since its debut at the start of October might've had more than a little something to do with that since there's nothing wrong with "There Will Never Be Another Tonight" other than it being fairly unremarkable. The type of radio-friendly rock track that Bryan could've released at any point in the previous six years, it at least helped ensure Waking Up... stayed put in the top 10 up until March. So much has already been written about "Smells Like Teen Spirit" that I'm not going to wax lyrical about Nirvana's breakthrough single here. After all, this is a blog about pop music written by someone who was never a fan of grunge. What I will say, though, is that as far as the Australian singles chart was concerned, the rock anthem was a game-changer. The Nevermind album had already been hovering around the top 10 for a month by the time its lead single made the top 50 - and the song made quick work of its trip to the ARIA top 5. 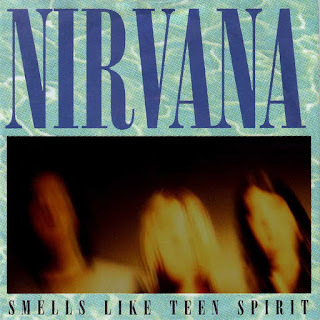 Like many songs that alter the face of popular music, part of the appeal of "Smells Like Teen Spirit" was that it sounded like nothing else on the chart. Together with the recent success of Metallica, it signalled a shift towards harder rock sounds than we'd been used to from the likes of Bon Jovi, Poison and even Guns n' Roses, and vocals that were more screamed than sung. Not only did Nirvana change things musically, but they also became the voice of a disaffected generation - something frontman Kurt Cobain was never that comfortable with. Very quickly, the rock acts that'd been successful in the '80s and so far in the '90s had to adapt or suffer the consequences of suddenly being out of step with the times. Naturally, where Nirvana led, so many others followed - and we'll see the impact of the success of "Smells Like Teen Spirit" and the rise of grunge as a significant musical genre as we venture into 1992. For me, while I could appreciate the catchiness of the hook in "Smells Like Teen Spirit", my taste in music meant I was more welcoming of Tori Amos's remake and Tinman's sampling of the guitar riff for "Eighteen Strings". 54. “Losing My Religion” by R.E.M. 84. “Mary Had A Little Boy” by Snap! After last year's problematic end-of-year chart, the top 100 for 1991 seemed to be a much more accurate summary of the biggest sellers of the previous 12 months. As I mentioned above, Bryan Adams's 11-week chart-topper predictably took out the title of number 1 single for the year, but there are few more things to note that weren't foregone conclusions. In runners-up position was Tingles by Ratcat - the release that still holds the record for the longest climb to number 1 within the top 100. It was one of 22 entries by Australian (or Australian-based) performers on the annual list. Interestingly, the local acts that performed best for the year - Ratcat, Melissa, Daryl Braithwaite, Divinyls and The Screaming Jets, who all made the top 20 - never featured on a year-end top 50 again. Solo female singers (and rappers) put in a pretty good showing, appearing on 28 of the top 100, compared to 25 singles by male solo acts (although it'd be 29 each, if you included Salt 'n' Pepa, Heavy D & The Boyz, Marky Mark & The Funky Bunch and Prince & The New Power Generation's two singles in the tallies). 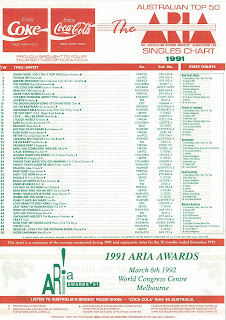 Unless I'm forgetting something, besides Bryan Adams's smash hit, there were another eight soundtrack singles on the top 100 - all but one of them ("Show Me Heaven" at number 55) inside the top 50. In terms of genres, 11 of the top 50 were songs predominantly comprised of rap - a situation that would have been unimaginable just a couple of years earlier. Dance, heavy metal, reggae and R&B tracks also rubbed shoulders with all varieties of pop and rock tunes, producing a more diverse annual countdown that ever before. The stage was set for a musically exciting 1992. Next time: speaking of which, we kick off our flashbacks to 1992 with the arrival of two massive duets - one by a pair of singers who'd worked together before, and the other, a collaboration few would ever have predicted. Plus, a second hit for a man who had a hard time keeping his clothes on. Before that, there are the final charts for 1983 (on December 25) and 1986 (on December 28) to look forward to. Then, around the New Year, I'll post my annual list of favourite songs. And, if I have time, I'll fit in a special post or two before the usual weekly flashbacks return on January 12. A not too exciting week for debuts for me; with Bryan Adams' being the 'best' of the lot. I never cared much for 'Smells Like Teen Spirit', partly due to its hype, though the verses are OK. The song came on one day in art class at school, and this 'metal' kid (long hair) was surprised that someone actually didn't like the song (me). I liked the completely different Tori Amos cover, though. As a sign of how commercial 'alternative' was becoming, my sister (who previously liked acts like Southern Sons, Bros and Indecent Obsession) around this time was into bands like Red Hot Chili Peppers... and Nirvana. Alias' 'More Than Words Can Say' being in the top 100 of the year, albeit at #98, seems a bit 'off' to me. The Rembrandts' track also seems like it doesn't belong there. 'Cream' seems to have gotten a raw deal when looking at both its 1991 and 1992 end of year chart placings. 'Freedom 90' seems a bit higher than it should be, and 'Break In the Weather' a bit low. But other than that, there are no glaring discrepancies when compared to the 1990 end of year chart. 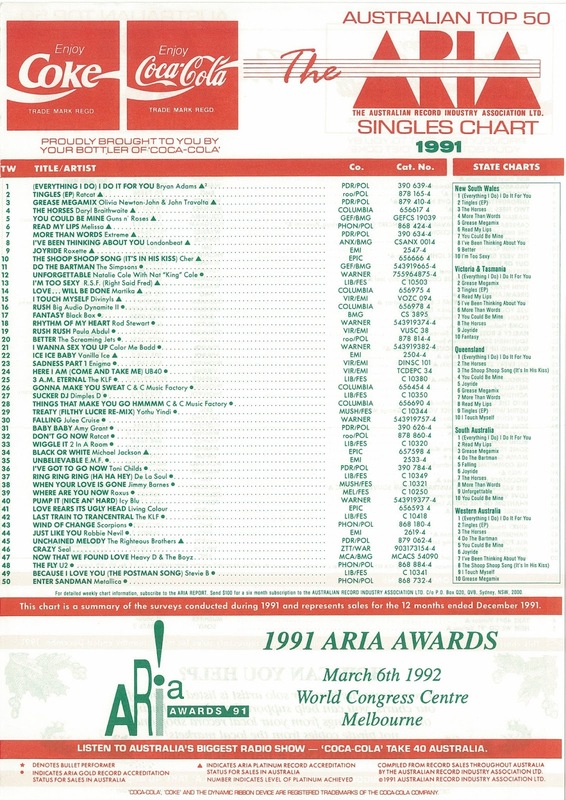 PS I meant to add - the #1 single of the year for most of the 90s in Australia seemed to be either a soundtrack tie-in or a novelty song. Collectively, we had pretty awful taste when it came to best sellers. Icy Blu made the year end Top 40!